One of the games we love is ‘My Little Sandbox’. 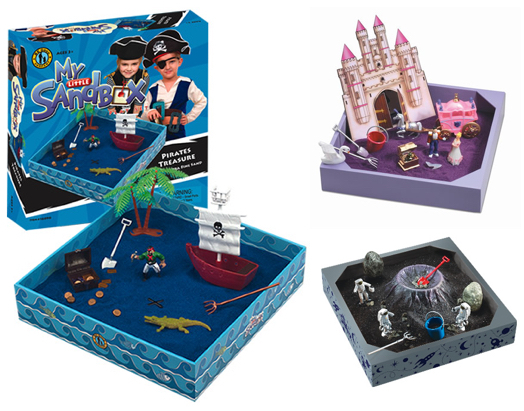 This is a game with colourful sand which comes in different themes (e.g., Pirate Treasure, Princess Dreams, Space Mission etc.) You can also make your own variations on this by choosing your own items. Imaginary play and storytelling: Develop a play scene with the items and make up a story together. You could even pretend some items are other things (e.g., a pencil could be the plank for the pirate ship). Take turns to tell the story together and expand the story. Retell skills and ability to use past tense: Encourage your child to retell ‘what happened’ in the play scene. You can add to your child’s retell by including: ‘who’ ‘what’ ‘where’ ‘why’ ‘how’ and ‘what happened in the end’. This could even become a writing task for older children. You could also describe certain actions that you did using past tense forms (e.g., I caught a fish. I dug a hole etc). Pronunciation: You can target a specific sound by choosing items (or things in the story) which start with this sound/have this sound in them (e.g., ‘s’: sand, sea, seal, seahorse, seat, swim etc). You could also hide pictures starting with this sound under the sand and dig it up as treasure. If your child is working on generalising a certain sound, then this can also be a great opportunity to try to tell stories whilst remembering this sound. Fluency: Depending on what stage you are at with your therapy you could target single words, repetitive phrases or descriptions with your ‘smooth talking’. Vocabulary: You can name items which suit the theme (e.g., pirate theme: pirate ship, treasure chest, hole, captain, compass, flag etc). You could even target descriptive words (e.g., a rough sea, a shiny shovel etc). Giving instructions: Take turns to give and follow instructions to set up the scene. Vary the length and complexity of your instructions according to your child’s ability (e.g., Find the pirate and put him next to the palm tree). You can target lots of location words (e.g., on, in, under, next to, in between etc). Giving descriptions/clues: Target your child’s ability to give/receive descriptions (e.g., I’m thinking of something that…). You could discuss colour, use, size, texture, sounds, category, first sound/letter etc. Supporting the concept of ‘Thinking with your eyes’: Pull all the items out and encourage your child to guess which item you are looking at by tracking your eye gaze. ‘Thinking with your eyes’ encourages the child to “explore the situation and the people in the situation to help them understand social expectations as well as others’ thoughts and feelings”. (Michelle Garcia Winner). Experiment and find other fun ways to play with this game … we hope you have as much fun with this game as we do. Enjoy!